On a mountain in the backwoods of Galilee, the resurrected Jesus, the One with total and complete authority, commissions His motley crew of followers to conquer the world with the Gospel. To teach those who will follow everything He had taught them over the last three years. To form people into His likeness. To make disciples. I’ve preached from this passage many times, including a five-sermon series found in Sermon Outlines for Busy Pastors: Volume 3. If you’re a pastor, I’m sure you have, too. It’s so rich in content. The message of Jesus found here is one we should emphasize over and over. In a very real sense, this is one of the primary reasons the church exists. So there’s a deep well to draw from for sermon material. There is a wealth of sermon ideas in these five verses. As you can see, I have at least 11 specific passage points. You can probably see even more. Each point could be a sermon itself. For example, take the first point: The Disciple’s Obedience. Jesus expects obedience no matter the circumstances. Jesus, after His resurrection, appeared to the disciples in Jerusalem. Jesus told the disciples to meet Him on a mountain in Galilee. Galilee was 90 miles north. Walking 90 miles was difficult and challenging. Jesus could have ascended from Jerusalem, but in God’s wisdom, Galilee was the place. The disciples’ obedience was expected, despite the circumstances. Jesus expects our obedience no matter the circumstances. Sometimes obeying Jesus, in our minds, might not make much sense. But God knows better than us. His will is not always revealed before we obey. But our obedience is expected, despite the circumstances. Obedience puts us in a position where we can be used by God. And they got to hear Jesus make monumental statements. And He commissions the disciples to carry on His mission. Jesus commissions them as His ambassadors. To continue what He had started. To bring the world to Him. Our obedience makes us useable to God. When we obey, we place ourselves in a place of opportunity. To do things we could never do on our own. To be an ambassador for Jesus Christ. To participate in bringing the world to Him. Jesus meets with us when we obey. The disciples would not see Jesus again in Jerusalem. If they wanted to see Him again, they had to obey and go to Galilee. If they wanted to know what Jesus had planned for them, they had to go to Galilee. If they wanted to know more, they had to obey. If we want to experience more of Jesus in our lives, we have to obey. We’ll never know the full extent of God’s plan for us if we’re not obedience. We’ll never see the full power of Jesus in our lives without obedience. If we want to know Jesus better, it begins with obedience. Obedience is the key to fulfilling God’s plan for our lives. A three-month sermon series could easily be developed from these points. A church singularly focused on the Great Commission for three months could be a catalyst for real change toward evangelism and discipleship. Several years ago, I put together a series of sermons based on the Great Commission. The series ran for five weeks. I’ll give you a quick summary of the series. Maybe it might help you to put one together yourself. 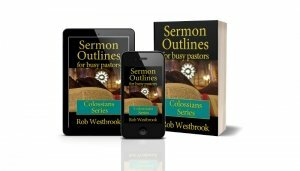 You can also find the series in Sermon Outlines for Busy Pastors: Volume 3 (book link). This sermon series is found in Volume 3. Click to see more information about the 53 sermons in this book. Here are the sermon titles and a synopsis of the sermons. We call this passage the Great Commission. Everyone knows the definition of “great.” But what is a commission? In this sermon, I define “commission” and what it means for us, as followers of Jesus Christ. What are the elements of our commission from Jesus? In sermon three, I try to answer the question “Where do we go?” I remind everyone these aren’t the last word of Jesus concerning evangelism. I use Acts 1:8 as a reference and develop the map Jesus gives us for going. I work off the fact that there’s only one command in the Great Commission. And it’s not “Go.” It’s “make disciples.” Then I work in some of the phrases from Matthew 28:19-20 as steps to obeying Jesus’ command to make disciples. There’s no better way to teach a Biblical principle than with a Biblical example. To give people a practical picture of carrying out the Great Commission, I use the Apostle Paul and his actions in the book of Acts as an example. So that’s an overview of a series of the Great Commission. I hope it may give you a few new ideas for preaching from a foundational passage of the Bible and our Christian faith. 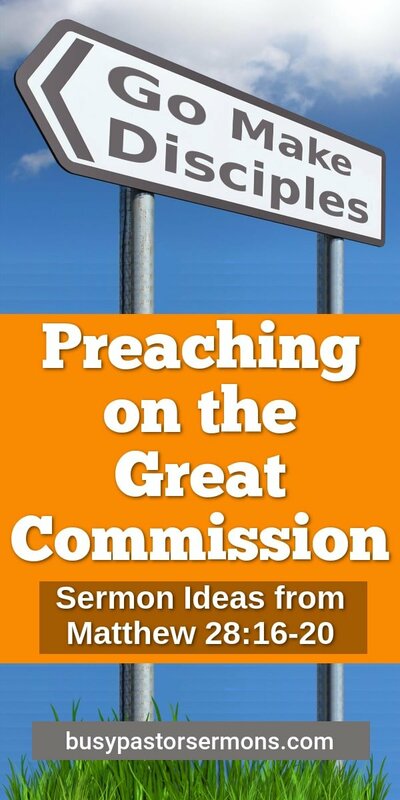 What are some examples of sermons you’ve preached on the Great Commission? Share them with us below in the comments.